The Crumar Mojo is the most authentic sounding Hammond clone I have ever played, and at 37 lbs is ultra portable. While the current production models are very well constructed, the early ones from the first production run are more of prototype quality internally, with some pretty sloppy wiring and component mounting. Some early Mojos have had problems of the computer locking up and going silent, requiring a reboot. 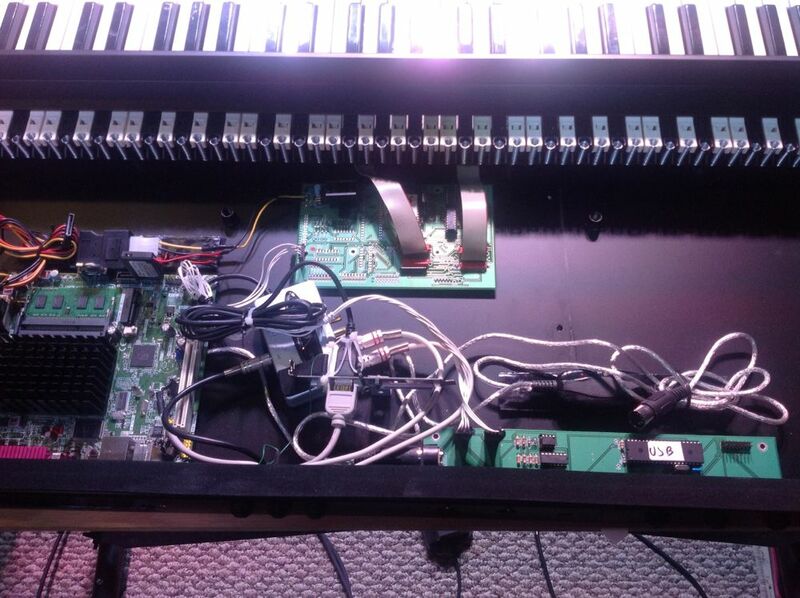 This is thought to be a problem of EMF getting in to the system and causing the sound card to crash. I have embarked on a cleanup of the internal components which is also intended to address grounding problems. These steps were recommended by Crumar. Disclaimer: I am sure Crumar is not recommending that their users muck around inside their organs, nor am I. They told me the engineering changes they had made, and I applied them. If you are not comfortable around computer hardware, can't handle a drill, or don't know how to observe static prevention protocols, you should not attempt this! Current production Mojo innards, nicely done. The inside of my Mojo, before cleanup. The inside of my Mojo, after cleanup. Much better! 1. 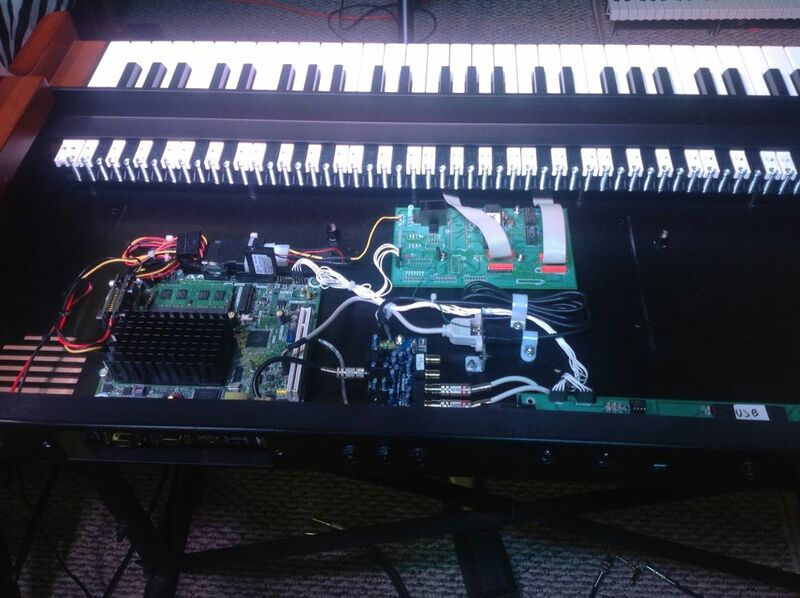 The keyboard scanner board (partially under the manuals) was mounted with velcro, so no good ground to the board existed. I drilled screw holes in the chassis thru the existing pcb mounting holes, then removed the pcb and cleaned up the velcro. Using a dremel tool, I scuffed the paint so that metal standoffs and machine screws provide a good chassis ground when remounting the pcb. 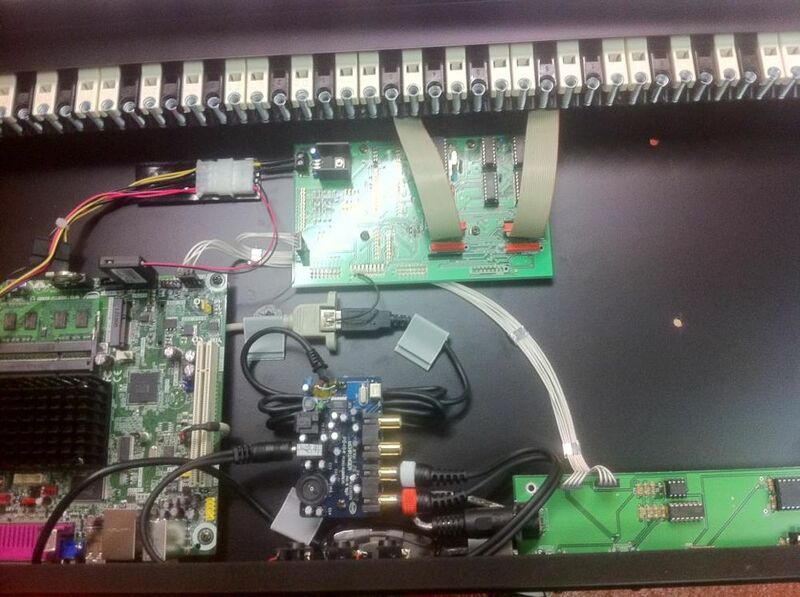 Scanner pcb mounting holes prepped for standoffs. 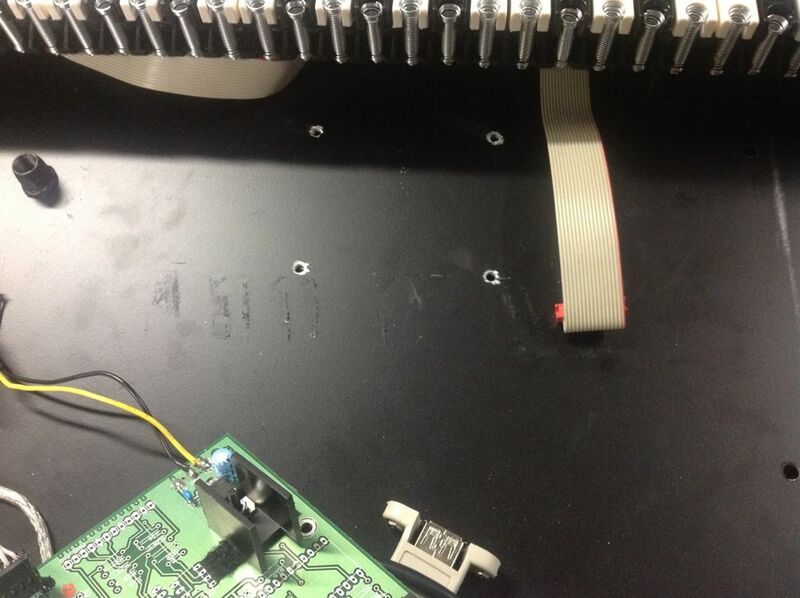 Scanner board remounted with machine screws and standoffs. 2. Scuff the paint around the power connector to provide a chassis ground. Chassis scuffed for power connector. 3. Remove cap soldered to output jacks and associated ground jumpers to CPU board. 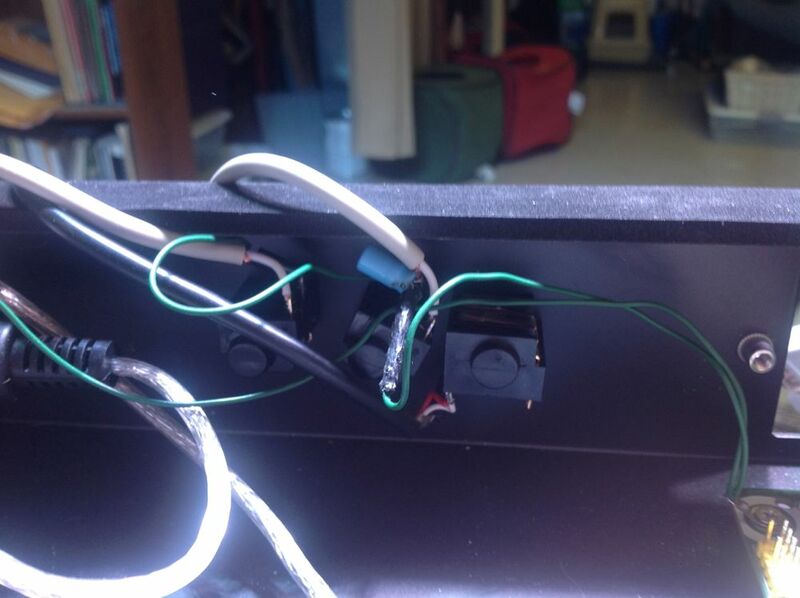 This was an attempted workaround to poor grounding and is no longer necessary. 4. 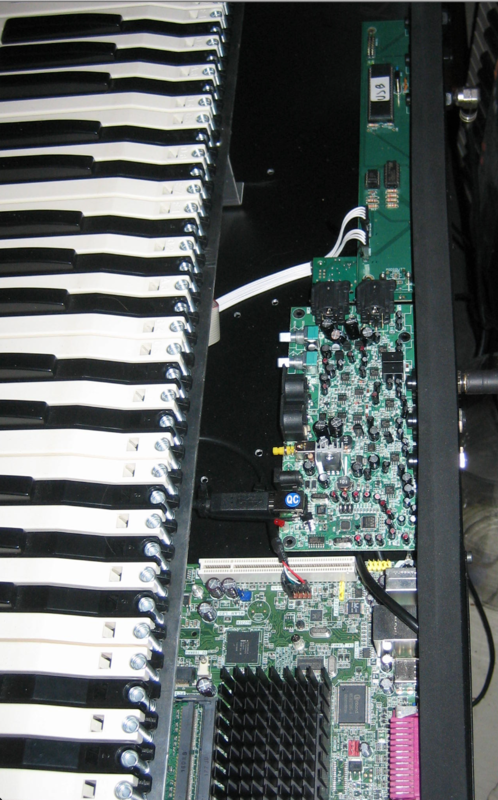 Remove Behringer sound card from plastic box, remove velcro mounting strips, drill chassis mounting holes and mount with machine screws and standoffs. No scuffing necessary. 5. Remove awkward USB connector bracket, cut down to lower profile and remount to chassis. Mount plastic cable management loops to chassis to hold USB sound card connection together. 6. 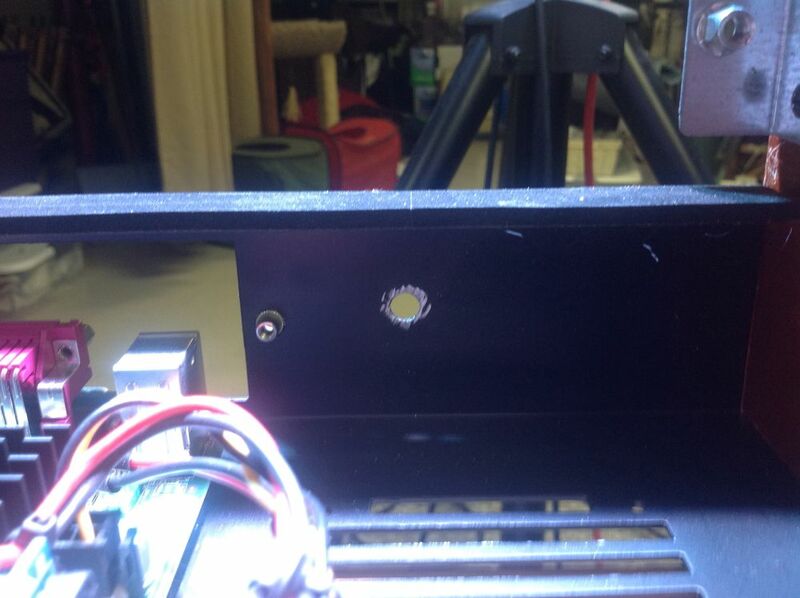 Solder ground wire to female USB connector and mount other end to ground point on scanner board. 7. 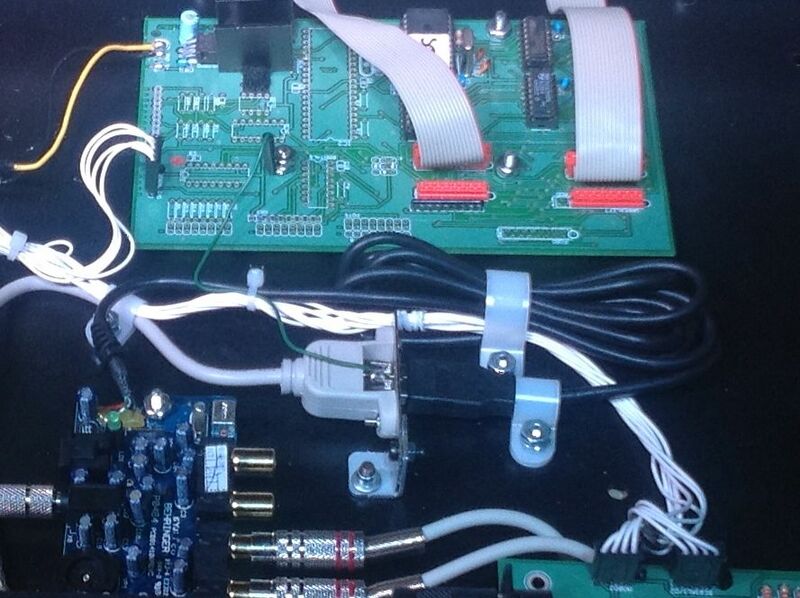 Tuck midi interface and wires underneath output board, harness neatly and mount using repurposed velcro. 8. Neatly dress excess cables with cable ties. 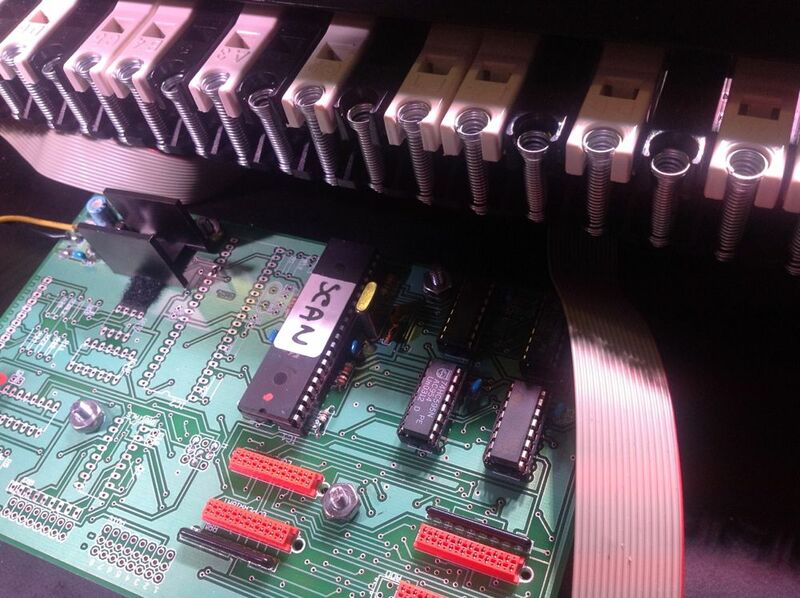 A couple of the internal cables could stand to be shortened further - the USB cable attached to the sound card, and the midi interface connectors. I would like to mount the power supply brick internally, and put a standard EIC power connector on the chassis.